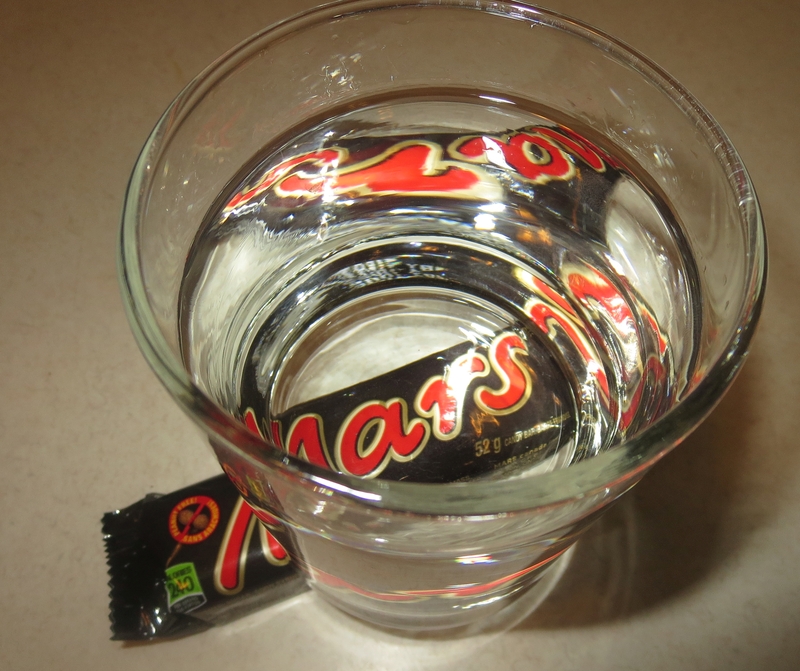 Water has been found on Mars. But it’s not the first time. Not since Schiaparelli published his drawings of Martian “canals” has the popular press been so excited about water on Mars. Giovanni Schiaparelli, an Italian astronomer, science historian, and senator, had a good clear view of Mars through his scope back in 1877. And that’s when the troubles began. But it wasn’t all his fault. In 1877, Mars was in opposition – an astronomical term that does not describe a state of feisty parliamentary politics but simply means that Mars was close to the Earth. In opposition, the Sun, Earth, and Mars form a straight line. The planet is millions of kilometers closer than usual, it lingers in the night sky, rises in the evening, sets at sunrise, and presents a fully illuminated face towards the Earth. Having a strong opposition, astronomically speaking, is a good thing. Schiaparelli’s view of Mars was so spectacular that astronomers call 1877 the year of “The Great Opposition”. The favourable opposition enabled Schiaparelli to sketch and name the continents and oceans of Mars. (According to Schiaparelli, Mars has places named Utopia, Eden, Arabia, Libya, and the Australe Sea.) But most famously, he mapped Martian channels. These were broad waterways that, to him, seemed to start a few hundred kilometres from both Martian polar ice caps and appeared to carry water to the parched red prairies where farmers (as efficient as any of their 19th century earthling colleagues) made the deserts bloom. At least this became the popular assumption shortly after Schiaparelli’s channels (canali, in Italian) were mistranslated as canals in English. You say channels; I say canals. 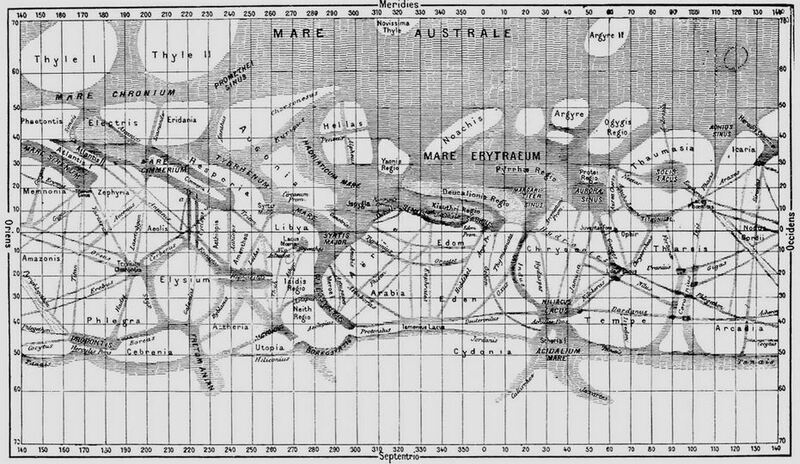 Schiaparelli implied both on his 1888 Mars map. Many of us possess lively imaginations that run more quickly than cautious reasoning. A prime example was a wealthy American, Percival Lowell. The Lowell family started as an ancient clan of Brits in America, the first of whom was also named Percival Lowell, a 1639 Newbury, Massachusetts, settler and merchant. The 20th century astronomer, Percival Lowell, had well-connected siblings. His brother, Abbott Lowell was president of Harvard (1909-1933) and distinguished himself by limiting the number of Jewish students allowed into Harvard and by banning black students from living on-campus in dorms. Lowell’s parents did not allow his sister, Amy Lowell, to attend college – because she was a girl. Amy Lowell was brilliant and became a self-educated, obsessive, collector of books. In 1926, she was posthumous awarded the Pulitzer Prize for her feminist poetry. Percival Lowell (1855-1916) had the money and enthusiasm to pursue anything that attracted his attention. He studied math at Harvard where his graduation speech was a discourse on the nebular theory, the idea that the solar system formed from the coalescence of nebulous matter. His talk in 1872 was unusually bold and decades ahead of his time, though he didn’t create the nebular hypothesis. (That credit goes to Immanuel Kant.) What does an agnostic cosmologist with a math degree do after Harvard? Percival Lowell ran a cotton mill for six years. Then it was off to Japan. Lowell spent about ten years in the Far East. His travels led to a series of books about oriental culture, language, education, personality, and religion. Those years also forged his own philosophy that centered on the idea of human progress as a function of human imagination. Unfortunately, his imagination would eventually take a bite out of his reputation. 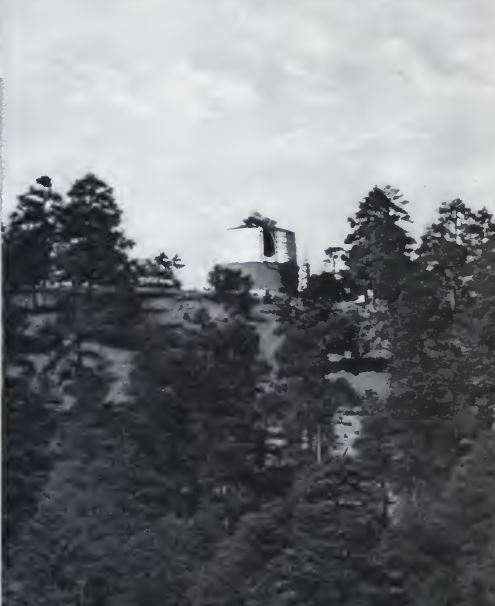 Mars Hill, Lowell’s Flagstaff observatory in 1910. Astronomy caught Lowell’s attention. With his wealth and connections, he pursued his hobby in an effusive manner. He studied American geography, looking for a place with dry clear night skies. A perfect place to set up a telescope. So he went to Flagstaff, Arizona, and built an observatory on a hill. Lowell Observatory was home to one of the best telescopes in America when it opened in 1896. The first instrument was a 24-inch Alvin Clark telescope, assembled in Lowell’s home town of Boston. It cost $20,000. From there, the instrument was carried across America to its permanent home on Mars Hill in Arizona. The Lowell Observatory is still in operation, still overseen by a trustee who is a member of the Lowell family, and telescopes there are still used there to peer into the sky. The observatory’s greatest achievement was the discovery of Pluto, made with a 13-inch telescope in 1930. To Schiaparelli, the republic of science owes a new and vast domain. His genius first detected those strange new markings on the Martian disk which have proved the portal to all that has since been seen and his courage in the face of universal condemnation led to exploration of them. He made there voyage after voyage, much as Columbus did on Earth, with even less of recognition from home. As with Columbus, too, the full import of his great discovery lay hid even to him and only by discoveries since is gradually resulting in recognition of another sentient world. Lowell concluded that technologically advanced Martians had built the canals in an effort to postpone the certain demise of their civilization as their planet dried and died. From Earth, from his perch at 1400 West Mars Hill Road, in Flagstaff, Arizona, Percival Lowell watched the fall of a once proud and noble Martian civilization. And this led to the fall of Lowell. With weak, faulty evidence, he reached a conclusion supported by little more than optical illusions seen on fuzzy images, encouraged by like- minded dreamers and his own powerful imagination. Lowell died relatively young, at age 61. Within his lifetime, his Martian canal observations were never confirmed by serious astronomers, nor did it seem likely that his maps of the surface of Venus or his speculation of the existence of Planet X would ever prove true. It was widely suspected that stress, disappointment, and embarrassment contributed to Lowell’s death. But he was not the failure that he felt he was. For one thing, Lowell mathematically predicted that a planet beyond Neptune must exist because of apparent gravitational interference with Neptune’s orbit. His Planet X speculation was vindicated 15 years after his death when Clyde Tombaugh used Lowell’s Flagstaff observatory and discovered Pluto. Just as importantly, Lowell fostered interest in astronomy and invested heavily in its popularization. He was arguably the most influential American astronomer until Carl Sagan came along decades later. Lowell’s imagination also made a huge contribution to exploration and discovery. The idea of advanced civilizations on distant planets ignited wonder and awe in countless science fiction fans who grew into mature scientists. Some even became involved in the modern Mars explorations which have found running water on the planet’s surface, one hundred years after Lowell’s death. NASA’s announcement of the discovery of water on Mars has once again roused the imagination of dreamers. Upon hearing the news, most of us immediately thought, “Water? Then maybe there’s life on Mars.” Sure, we accept that Martian life will not include an aging advanced civilization. But these days, the discovery of a couple of replicating strands of molecules found on another world will be every bit as thrilling. There is just one more thing to round out this story. Remember the water channels? Here is a NASA photograph of the briny rivers flowing on Mars. The rivulets appear as a series of dark streaks. They look a lot like canals. This entry was posted in Culture, Exploration, Geology, Space and tagged Flagstaff, Mars, Martian canals, NASA, Percival Lowell, Schiaparelli, water on Mars. Bookmark the permalink. It will be interesting to discover where the water is coming from..
From the NASA photos, the flowing water seems out of place, doesn’t it? Somehow the rivers appear to be unearthly.